Brisbane and on the Gold Coast since 1965. We are an entertainment company focused on delivering great memories and experiences to millions of children and families. 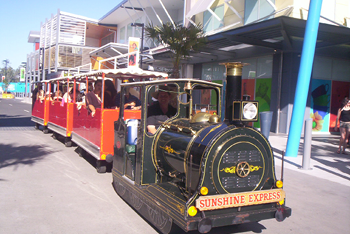 Trackless trains AND MANY MORE AMUSEMENT RIDES! 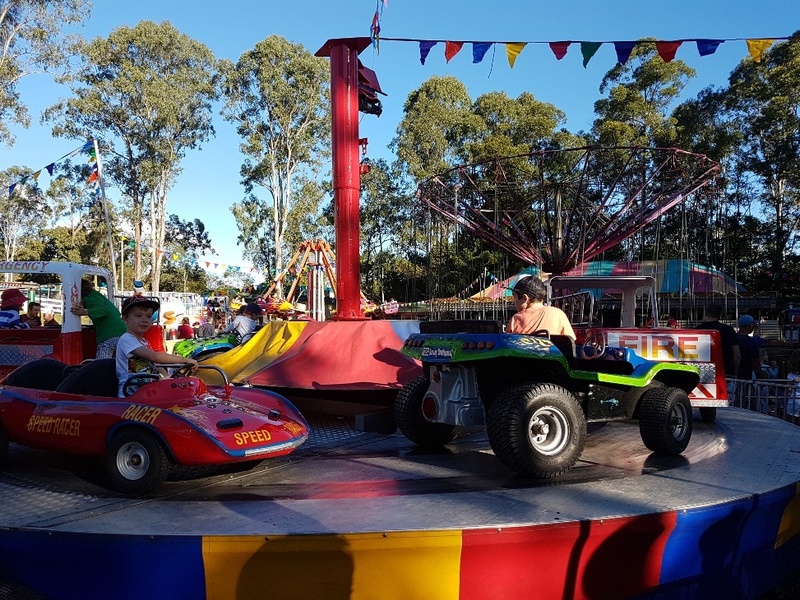 ALL of our amusement rides come with trained, experienced operators and all of the necessary safety equipment to ensure the safety of our guests and staff members. 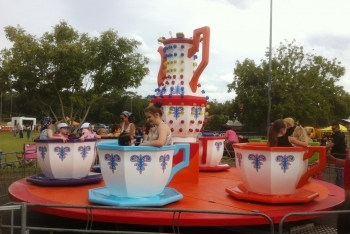 The Cup & Saucer holds 24 adults and children and is a great addition to any event. So this ride suits from toddlers with Mum & Dad to teenagers. When the sun goes down, the lights go on... spectacular. A must have at any event or school fete. Go Speed Racer! Two fire engines, two corvettes, two dune buggies, too much fun! This sensational ride holds up to 34 riders of all ages. Great for school fetes as it really chews through a line. Comes complete with an experienced operator and safety barriers. Get lost in the maze with your mates. maybe you will be out before dinner? 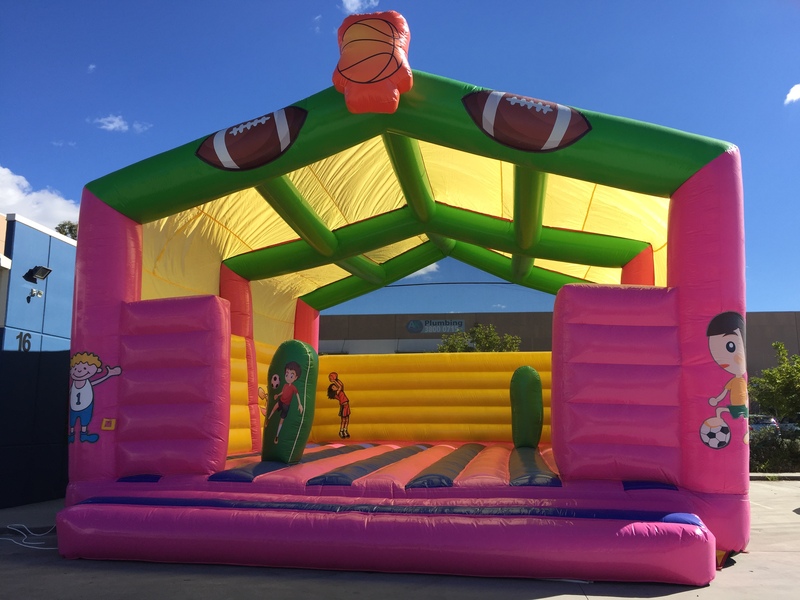 This inflatable attraction offers excitement for all ages, and is a formidable and imposing structure. 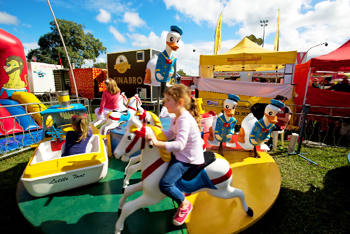 What show or carnival would be complete without this great showground tradition? Kids love it! 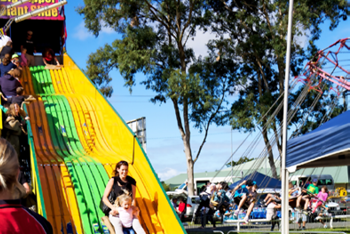 Takes up to 12 children at a time and is 7 metres high to give you a birds eye view of the fair! Tick tock, tick tock, can you beat the clock? A test of balance, stamina and skill. Loads of fun! These little beauties are fun, colourful, and are very popular. They put you right in the drivers seat. They feature smooth quiet motors powerful enough to take two riders on just one ticket. This is the 'Go anywhere train'. It comfortably seats up to 36 passengers of all ages. Our experienced, uniformed engineer will guide the train and it's colourful carriages expertly around your fair. Absolutely perfect as a people mover for large events, parking areas, or factory tours. This is one of our most popular rides! Small to very small children love it because it was designed specifically for them, but it's strong enough to take those older children who want to share the experience. Race your mates on this classic racetrack. 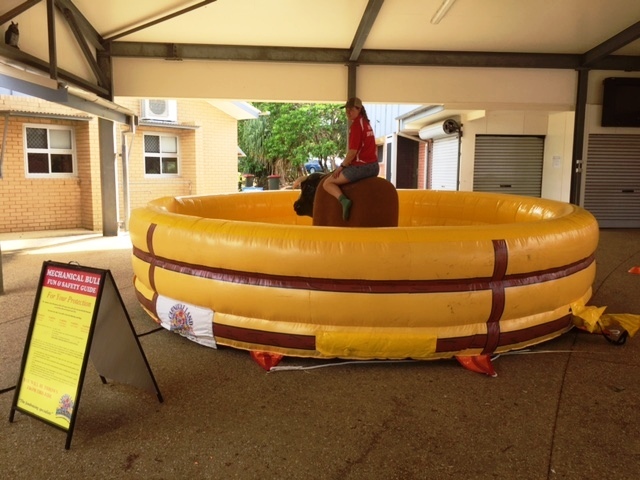 What could be more realistic than an inflatable horse running on an inflatable track? Watch the jockey's jostle for position. It's hysterical. 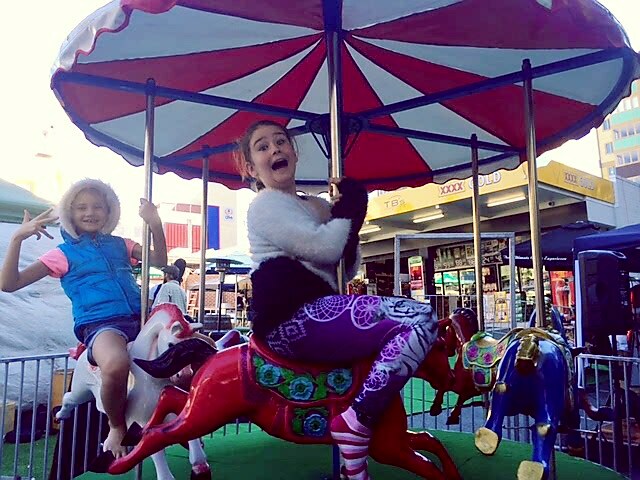 Twirls the littlies around and around, a popular ride with a gentle pace and sure to put smiles on kid's faces. Great safe fun!! Very safe, very challenging! 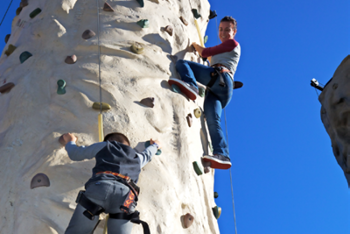 This self-belaying mobile rock-climbing wall is suitable for any event and is a great activity for those who don’t necessarily like the spinning rides. Four people can climb at one time. Climb to the top of one ascending pathway…. There are four to conquer! Let the duel begin.... 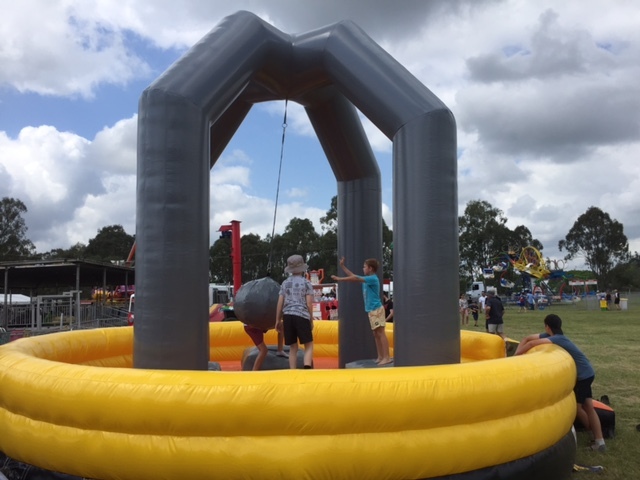 Try to knock your mates off their pedestal with the ultimate demolition wrecking ball. Show no mercy as they begin to loose their balance. This colourful ride has been designed especially for the 'littlies' with six prancing ponies. 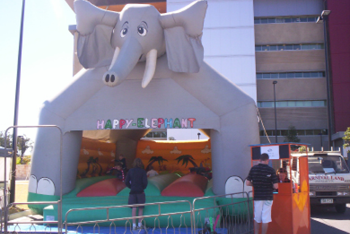 Great for a “kiddies” area at larger events, shopping centre promotions, and so much more. This beauty has 3 big lanes, and is fun for all ages. Comes complete with two experienced operators and safety barriers. Semi Trailer mounted, this slide is enormous. 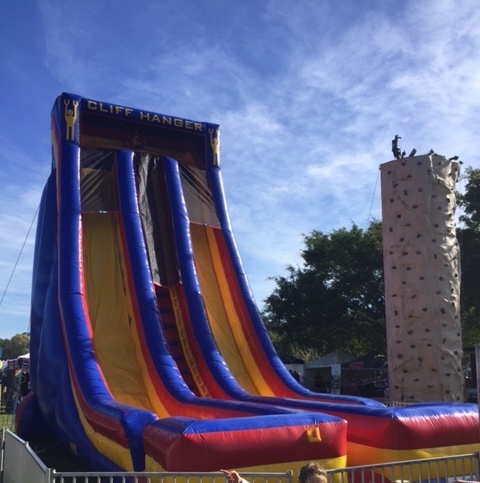 Essentially the same as the Super Slide with three sliding spaces, however this has one speed - Fast! 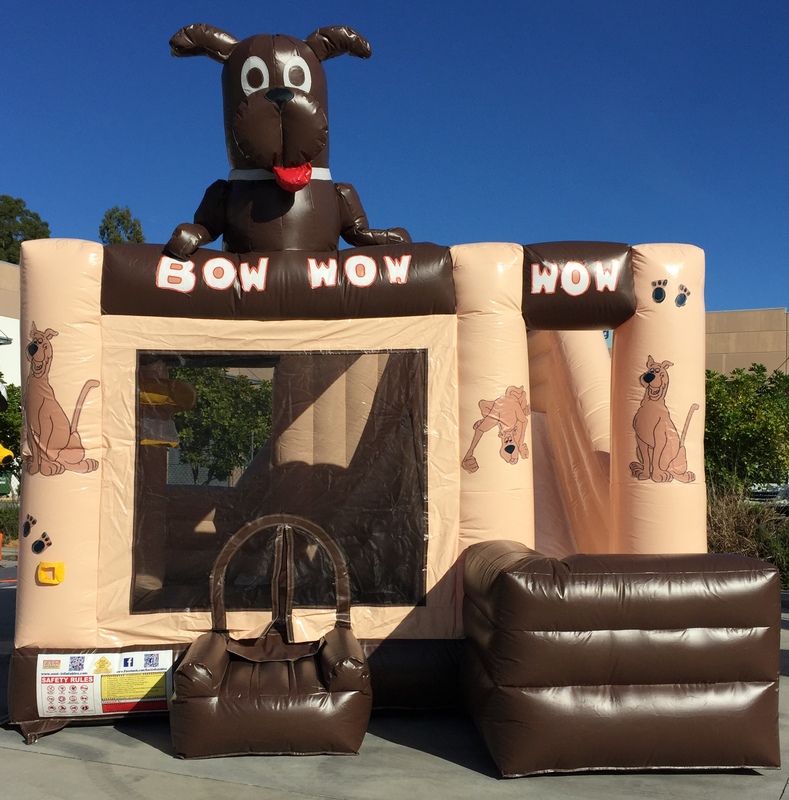 This giant inflatable slide will test your metal. It's very big, it's very long, and it's very fast. Sliding for 20m at pace. It is nothing to be sneezed at! Great fun for those little dare devils on a soft surface. 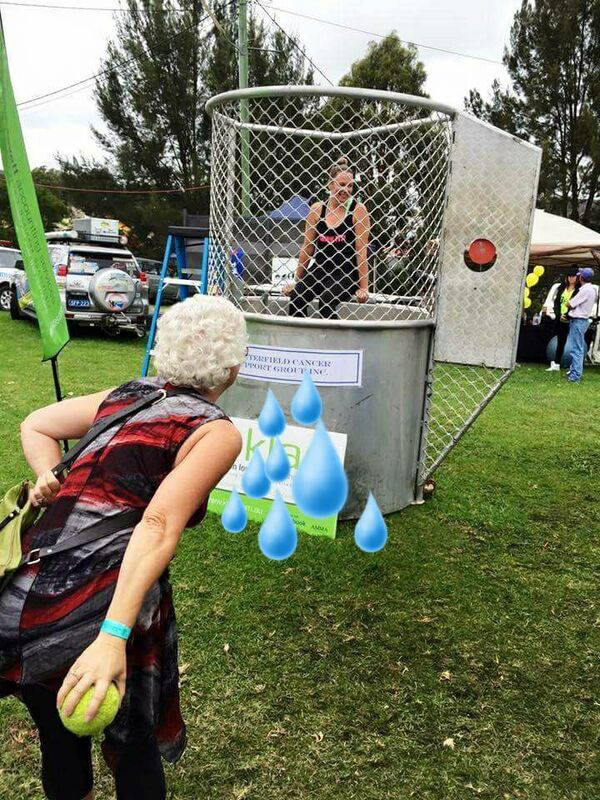 With its splashtacular action, the Dunk Tank is fun for all ages. You can dunk anyone from a school principal, someone famous, even your best friend. You may even want to get dunked yourself! Crowds line up for a chance to test their skill and soak their opponents. A crowd pleasing attraction for any event. 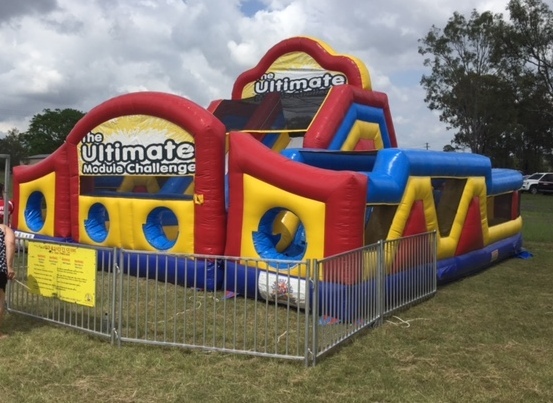 A jumping castle, obstacle course and slide all in one. This is a favourite with everybody. 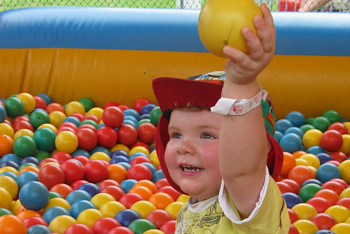 It's enormous, it's colourful, it's themed as a circus and yes, it's as much fun as it looks!! The kids just go wild over the vast areas of bouncing space and the slide. This is big, it's very big, and just a little bit scary. Our brand new Haunted House is with out a doubt, one of Brisbane's most popular Halloween attractions. It's mad up of one big slide, and 2 jumping areas on each side. This is another massive castle, and great exercise! An awesome way to burn up a bit of that excess energy. 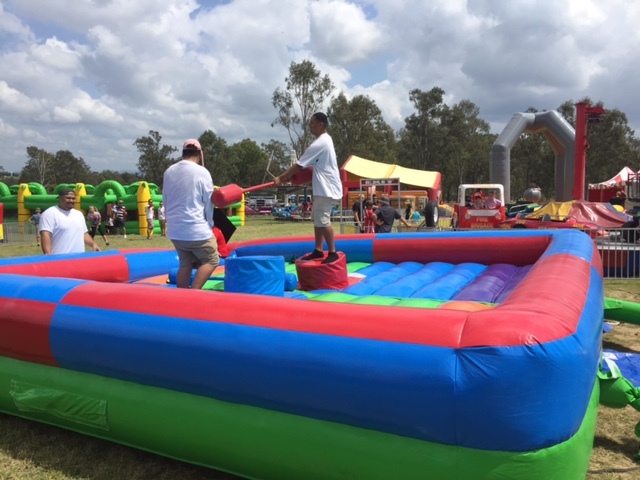 Our Sports Castle is extremely popular at both fetes and sporting breakups / trophy days. 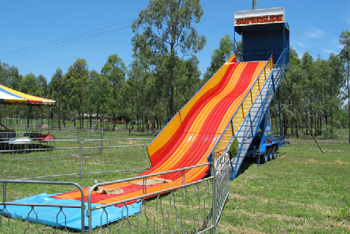 It is made up of a big slide and two jumping areas. One on each side. This is big and exciting! It's as big and exciting as Egypt itself! Beautifully presented, our Lost Temple is without a doubt a spectacular attraction for your fete, carnival or picnic. 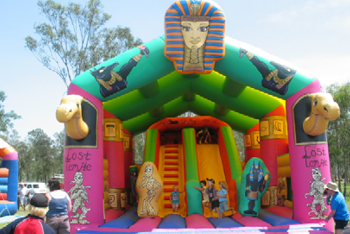 It's made up of a big slide, characters to attack, obstacles and hieroglyphics! This is big, it’s very big, just like the jungle. Our brand new Jungle themed castle is very popular. It’s made up of one big slide, and 2 jumping areas on each side. The Giant Elephant is just like the Donkey, only themed differently. Lots of jumping, rolling, bouncing, shoeless fun. These castles are huge! Impressive where ever they are. The children just love it. This is big, it's very big and great exercise. 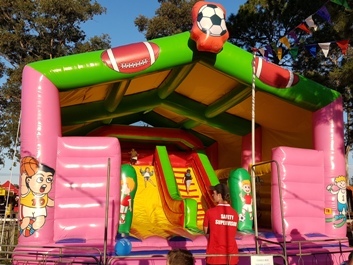 Our Sports Jumping Castle is extremely popular at fundraiser fetes and sports break up parties. This one has one massive jumping area. Jump on the locomotion Train Castle! 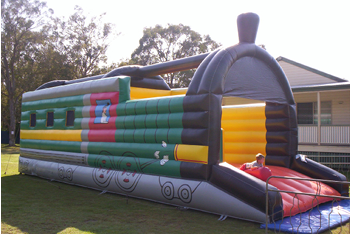 Looks the part with the shape and theming of a train down both sides of the inflatable. Great for Western theme events, or lovers of trains. 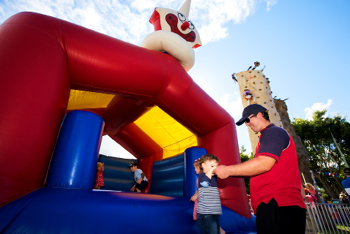 The Clown Castles are a great addition to any event. In fact we have 5 of them! Again vastly coloured, deep bouncing area, air inflated packages of fun! Scooby Doo eat your heart out. 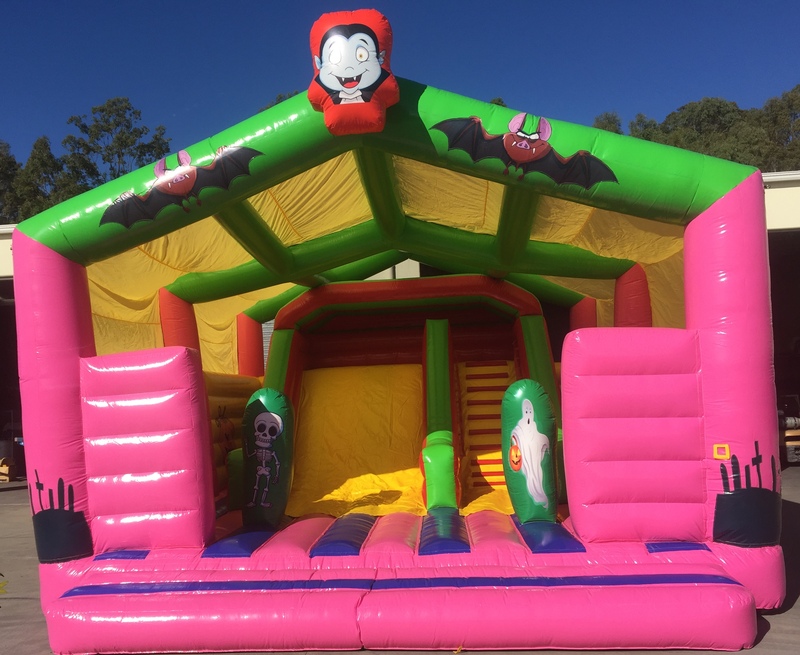 This little beauty is perfect for the younger age groups, and a great addition close to larger castles for the little ones to get their confidence up. Perfect on their own as well!! It's colourful, it's cute. 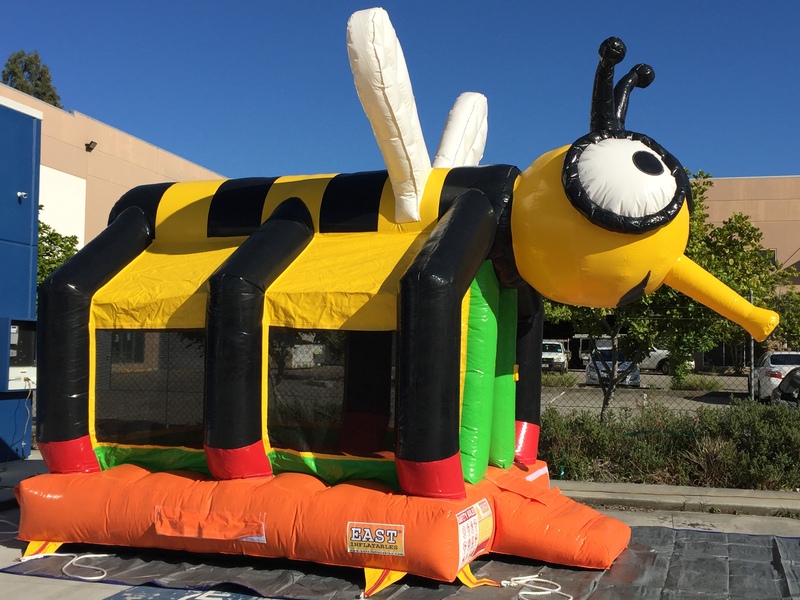 This inflatable is a little beauty and is perfect for the younger age group. 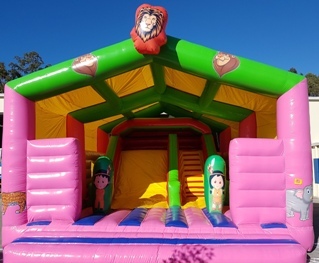 It's also a castle which is a great addition next to a larger castle for the little ones to get their confidence up. Perfect on it's own too. This is a colourful, inflatable, fun-house with an airbed floor and filled with 100's of multicoloured balls for the smaller kids to roll around and 'swim' in. 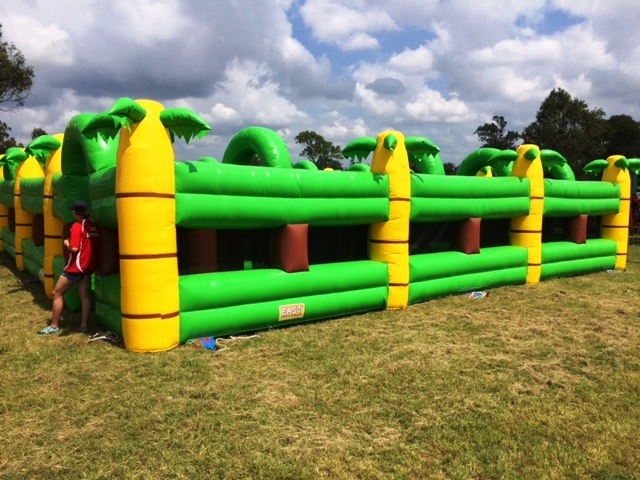 The Giant Worm offers plenty of fun for the kids, in fact, it is more fun than a long barrel full of monkeys!! Great for the little ones, our giant colourful friend is a very hungry caterpillar indeed. 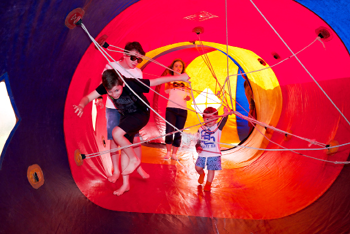 At 15m long the kids will love making their way through, bouncing all the way! Great fun for the little ones. They will love making their way through the tunnel, bouncing all the way. 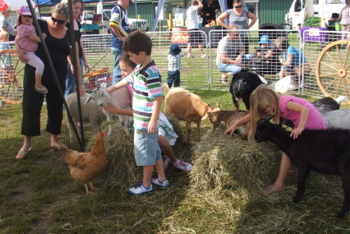 What could be better than having a visit from a petting zoo? Few people can resist the chance to meet and pat our baby animals. 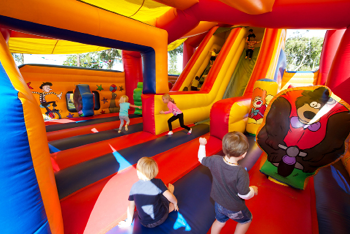 We will create a fun farm atmosphere at your function that is appealing to both children and adults alike. 3 Years of age unaccompanied. Under 3 years accompanied by a responsible person. 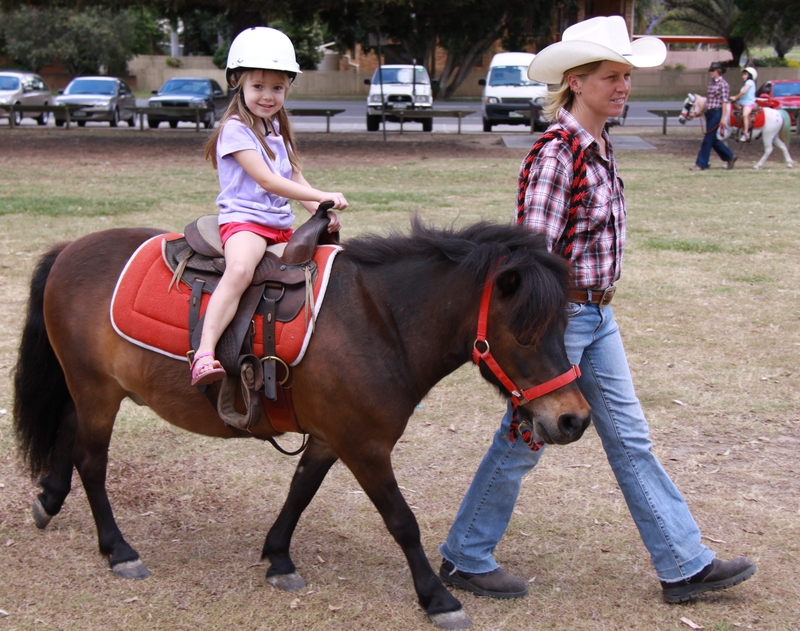 What is more memorable than your first pony ride? Our beautiful Shetland ponies come with all necessary safety equipment and an experienced handler. 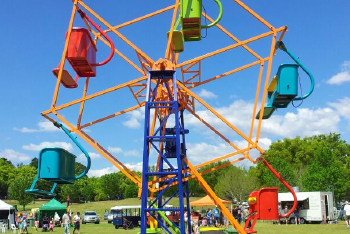 PLUS more amusement rides to choose from! 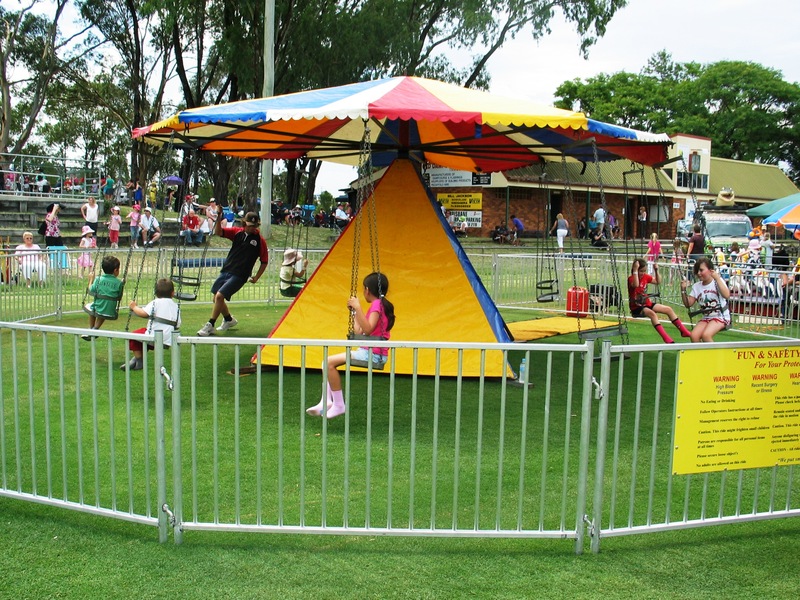 For any of your requirements for amusement rides in Brisbane, Gold Coast, Toowoomba, Ipswich or on the Sunshine Coast. 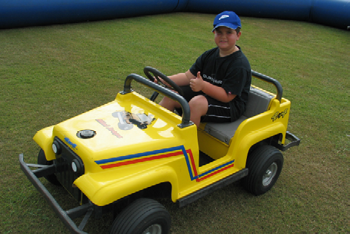 We are committed to providing you with safe quality amusement rides along with the highest level of personal service and safety.